Enjoy some of the finest hospitality on the Queen Victoria as you cruise around the world experiencing fine dining, luxurious cabins and more. The Queen Victoria is a ship that will provide you with all the facilities you need to make your cruise holiday unforgettable, whether you are journeying around the world or sailing around the Mediterranean. 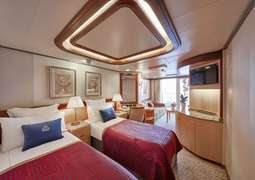 The premium quality can be seen in all aspects of the ship from the luxurious and spacious cabins to the 'Britannia Experience', a beautiful hall where fine food is served nightly. In the 'Royal Court Theatre' you can see Jazz, Blues and Soul concerts, and reel in the years with classic movies in the theatre. If you wish to keep active on board you can enjoy activities like fencing, tennis or golf. 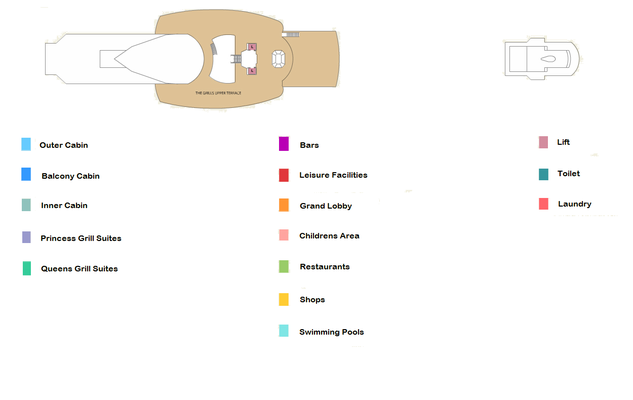 There are also swimming pools and hot tubs on board the Queen Victoria. For those who want to relax the 'Royal Spa' is perfect, with all the relaxation and care areas with the benefit of a magnificent view. If you prefer to unwind in other ways why not try 'Churchill's Bar', where you can enjoy a fine cigar and a drink in a distinctly British atmosphere. All of the different ways to spend your time on board the Queen Victoria means you will always hold it as an amazing experience. 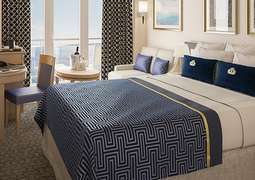 Choose from a wide range of stateroom categories, all of which are furnished in a classic, luxurious way and offer a large selection of amenities. 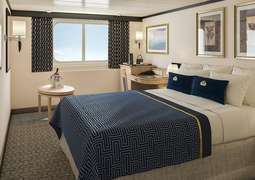 Guests of the Britannia cabins enjoy a 24-hour cabin service and dine in the exclusive Britannia restaurant. Residents of the Princess Grill Suites benefit from many additional amenities, such as a concierge service and a fruit basket and champagne as welcome gifts. The Queens Grill Suites are the home to absolute luxury and promise to leave no wish unfulfilled. Experience exquisite cuisine on board the Queen Victoria. The 'Britannia' restaurant stretches across two floors and charms guests with an elegant atmosphere created by fine glass and bronze detailing. Another highlight is the restaurant ‘Todd English’, which was named after it's famous chef who personally prepares Mediterranean delicacies for your enjoyment. The more casual restaurant, 'Lido', provides a great buffet selection all day long, and offers Italian, Asian and Indian dishes in the evening. Guests in the Princess Grill Suites dine in the intimate 'Princess Grill' restaurant with a panoramic sea view. This restaurant is reserved exclusively for Princess Grill Suites residents. All guests are invited to use the 12 unique bars, lounges and pubs. In the 'Golden Lion' pub you can enjoy traditional English pub food, beer and cider in a cosy setting or savour a glass of port, cognac or Madeira in the 'Churchill Cigar' lounge. No matter how you decide to pass your time on board the Queen Victoria, we can assure you that you will never get bored. Learn about the early days of sailing and about Cunard’s origins in the museum, or test your luck with a round of roulette, blackjack or poker in the casino. A popular stop on board is the 370 m² shopping mall, which accommodates many boutiques of internationally renowned designers. Head to the 'Royal Court' theatre after the sun goes down to enjoy a first class evening programme. Endless activities provide hours of entertainment on board the Queen Victoria. The conference rooms are not only used for meetings, but also for various programmes, such as art classes, wine tastings and classes about navigation and shipping. Attend an interesting lecture by a renowned speaker or simply relax on the sun deck after a refreshing dip in one of the swimming pools. The Queen Victoria offers an extensive and stylish spa and wellness area. Relax in the hydrotherapy pool and the thermal suites or treat yourself to a relaxing beauty or wellness treatment. Use one of the many fitness machines to work up a sweat in the gymnasium, or play a round of table tennis, golf, shuffleboard or table tennis. If you’re after something different, you could also learn to fence onboard. Internet on board: Wireless internet access is available for a fee. Build in 2007, Queen Victoria was made by the Italian shipyard Fincantieri. Since its completion, it has operated for Cunard under the British flag. Like the other two Cunard ships, it is named after a former British sovereignty and equipped in the style. With its length of 294 meters, it has 995 guest cabins on 12 decks. Thus it has a capacity of 1990 passengers, which are supported by a 1003-member crew on double occupancy. As already mentioned, this ship is equipped with thousands of British charm. 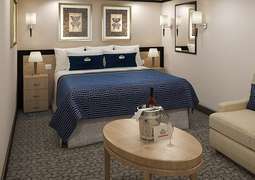 Here you can learn what true luxury is on a cruise. On the Queen Victoria you can relax without ever getting bored. Browse at your leisure in the two-storey library on board and read through some amazingly good books. You can do this while you relax in one of the whirlpools. There you can enjoy the view but also easy. Alternatively, it is available also free in the gym Černý is the chance to then treat yourself right at the spa. You have several options. And the same goes for the food. Here you can choose from several restaurants, that is, here is something for everyone! The quality of food leaves nothing to be desired and will enchant you along with the charm of the restaurants. After dinner, treat yourself to your favorite cocktail in one of the many bars on board. Here you can watch the sunset alone and let it finish the day. The Queen Victoria travels on many different routes. With it you can cover both European seas, such as discovering the Mediterranean, as well as both American coasts. From the US west coast, it is possible you even to take a cruise to the Hawaiian Islands. Even the Panama Canal, the Caribbean and the US East Coast regularly operated over by the QV. Browse at your leisure in the range of travel and discover your dream trip. Want more information on the Queen Victoria? Then use our free hotline and get personalised advice from our CruiseAway team. A friendly service is a matter of course for us. With CruiseAway you get a fast and smooth handling- guaranteed. The CruiseAway team wishes you a pleasant journey with the Queen Victoria!